Fluoroscopic image of TIPS in progress. A catheter has been passed into the hepatic vein and after needle puncture, a guidewire was passed into a portal vein branch. The tract was dilated with a balloon, and contrast injected. A self-expandable metallic stent has yet to be placed over the wire. Transjugular intrahepatic portosystemic shunt or transjugular intrahepatic portosystemic stent shunting (commonly abbreviated as TIPS or TIPSS) is an artificial channel within the liver that establishes communication between the inflow portal vein and the outflow hepatic vein. It is used to treat portal hypertension (which is often due to liver cirrhosis) which frequently leads to intestinal bleeding, life-threatening esophageal bleeding (esophageal varices) and the buildup of fluid within the abdomen (ascites). An interventional radiologist creates the shunt using an image-guided endovascular (via the blood vessels) approach, with the jugular vein as the usual entry site. The procedure was first described by Josef Rösch in 1969 at Oregon Health and Science University. It was first used in a human patient by Dr. Ronald Colapinto, of the University of Toronto, in 1982, but did not become reproducibly successful until the development of endovascular stents in 1985. In 1988 the first successful TIPS was realized by M. Rössle, G.M. Richter, G. Nöldge and J. Palmaz at the University of Freiburg. The procedure has since become widely accepted as the preferred method for treating portal hypertension that is refractory to medical therapy, replacing the surgical portocaval shunt in that role. Portal hypertension, an important consequence of liver disease, results in the development of significant esophageal, gastric, rectal varices). A TIPS procedure decreases the effective vascular resistance of the liver through the creation of an alternative pathway for portal venous circulation. By creating a shunt from the portal vein to the hepatic vein, this intervention allows portal blood an alternative avenue for draining into systemic circulation. In bypassing the flow-resistant liver, the net result is a reduced pressure drop across the liver and a decreased portal venous pressure. Decreased portal venous pressure in turn lessens congestive pressures along veins in the intestine so that future bleeding is less likely to occur. The reduced pressure also makes less fluid develop, although this benefit may take weeks or months to occur. Steps in a TIPS procedure: A) portal hypertension has caused the coronary vein (arrow) and the umbilical vein (arrowhead) to dilate and flow in reverse. This leads to varices in the esophagus and stomach, which can bleed; B) a needle has been introduced (via the jugular vein) and is passing from the hepatic vein into the portal vein; c) the tract is dilated with a balloon; D) after placement of a stent, portal pressure is normalized and the coronary and umbilical veins no longer fill. Transjugular intrahepatic portosystemic shunts are typically placed by an interventional radiologist under fluoroscopic guidance. Access to the liver is gained, as the name 'transjugular' suggests, via the internal jugular vein in the neck. Once access to the jugular vein is confirmed, a guidewire and introducer sheath are typically placed to facilitate the shunt's placement. 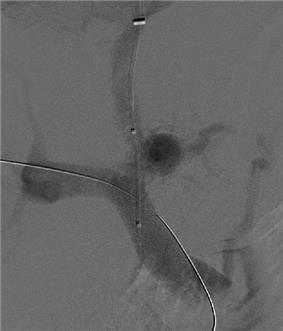 This enables the interventional radiologist to gain access to the patient's hepatic vein by traveling from the superior vena cava into the inferior vena cava and finally the hepatic vein. Once the catheter is in the hepatic vein, a wedge pressure is obtained to calculate the pressure gradient in the liver. Following this, carbon dioxide is injected to locate the portal vein. Then, a special needle known as a Colapinto is advanced through the liver parenchyma to connect the hepatic vein to the large portal vein, near the center of the liver. The channel for the shunt is next created by inflating an angioplasty balloon within the liver along the tract created by the needle. The shunt is completed by placing a special mesh tube known as a stent or endograft to maintain the tract between the higher-pressure portal vein and the lower-pressure hepatic vein. After the procedure, fluoroscopic images are made to show placement. Pressure in the portal vein and inferior vena cava are often measured. Procedural complications during a TIPS procedure, including bleeding and direct injury to the liver, are uncommon. In the hands of an experienced physician, operative mortality is less than 1%. On the other hand, because TIPS reduces or eliminates first-pass clearance of nitrogen from the gut, up to 25% of patients who undergo TIPS will experience transient post-operative hepatic encephalopathy. In general, this can be managed with a reduction in dietary protein and medication that reduces the absorption of nitrogen. A less common but more difficult complication is hepatic ischemia. Portal hypertension—the condition shared by all TIPS patients regardless of etiology—generally causes compensatory hypertrophy of the hepatic artery and a decreased reliance of the liver upon the portal vein for its oxygenation. For this reason, shunting of the portal blood away from hepatocytes is usually well tolerated. In some cases, however, TIPS creation can cause an ischemic injury to the liver. Acute hepatic dysfunction after TIPS may require emergent closure of the shunt. ^ Rössle M, Richter GM, Nöldge G, Palmaz JC, Wenz W, Gerok W (1989). "New non-operative treatment for variceal haemorrhage". Lancet 2 (8655): 153. ^ "What You Need to Know about the Transjugular Intrahepatic Portosystemic Shunt (TIPS).". Cleveland Clinic. ^ Guevara M, Rodés J (2005). "Hepatorenal syndrome". Int. J. Biochem. Cell Biol. 37 (1): 22–6. ^ Rossle M, Piotraschke J. Transjugular intrahepatic portosystemic shunt and hepatic encephalopathy. Dig Dis 1996; 14:12–19. ^ Mayan H, Kantor R, Rimon U, Golubev N, Heyman Z, Goshen E, Shalmon B, Weiss P.: "Fatal liver infarction after transjugular intrahepatic portosystemic shunt procedure." Liver, 2001;21(5):361-4. ^ Mallavarapu RK, Grimsley EW (2007). "Incarcerated umbilical hernia after transjugular intrahepatic portosystemic shunt procedure for refractory ascites". Clin. Gastroenterol. Hepatol. 5 (9): A26.